After a week of dithering- yesterday there was Decision and Action! I’m not sure what shifts when that happens. I stop over thinking it so much and get out of my own way. I gave the green cell barrier a few more couched lines and definition. That still has a little more stitching to go. 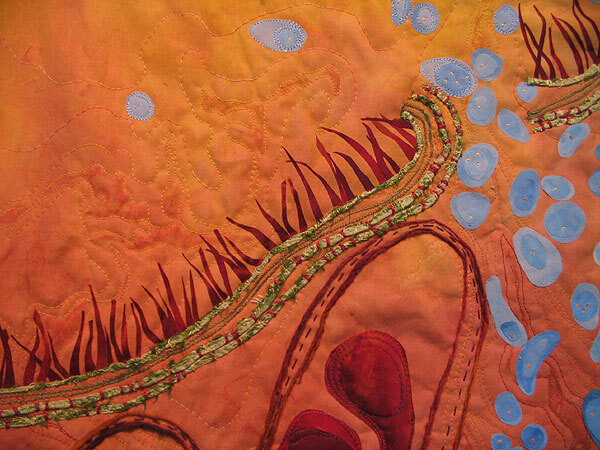 And I had a blast cutting and fusing on the “cilia” hairs. I thought this step would be tedious but I loved playing with the spatial interrelationship between the individual cilia-those tiny negative spaces created. I wanted then to look in motion and I’m pleased with how that turned out. 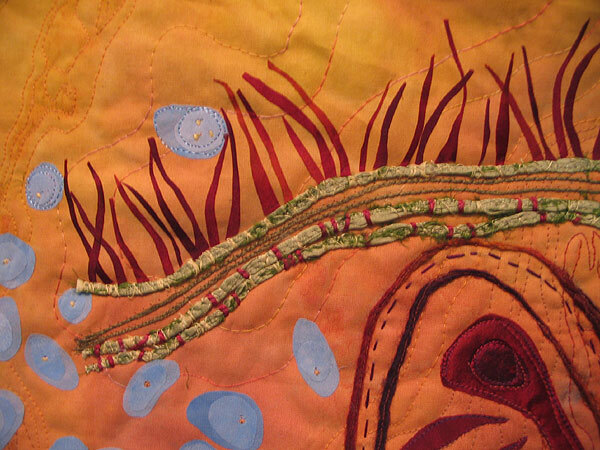 Today’s a perfect rainy day for listening to podcasts and stitching down all those lovely little” hairs”! This entry was posted on June 5, 2010 at 10:38 am and is filed under Process. You can follow any responses to this entry through the RSS 2.0 feed. You can leave a response, or trackback from your own site. Hi Karen, I love the piece above. It reminds me of the hours I spent looking thru microscope slides of cells etc. in college. I thought there was a whole beautiful world there. Your dyed fabrics are great. You really get a rich color. If you get a chance visit my blog at http://www.lanasthreadsandmusings.blogspot.com. Do you sell your dyed fabrics online? I did visit your blog and was amazed at all the various, adventurous materials you use to make your art-and with intriguing results! You seem fearless in your explorations.